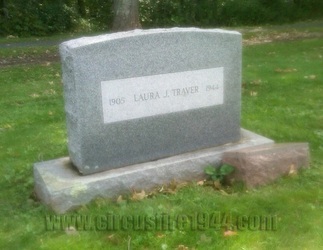 Mrs. Laura Josephine (LeClair) Traver, age 39, of 11 Seneca Road, Bloomfield, was born January 30, 1905 in Vermont, daughter of Emma (Patenaude) and Aloysius G. "Louis" LeClair. She was found seriously injured at the circus grounds after the fire on July 6 with 2nd and 3rd degree burns and was taken to Municipal Hospital where she was treated with plasma, dressings, and morphine. Unable to retain fluids, Laura died after 2pm on July 9 from toxic glomerulonephritis with renal failure. She was buried at Mountain View Cemetery in Bloomfield after services at the Marchant Funeral Home on July 12. 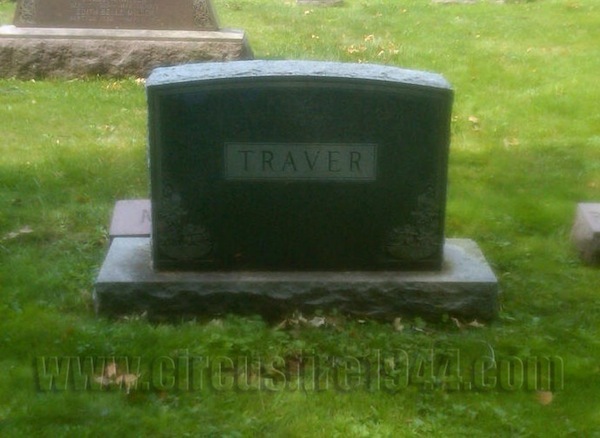 Mrs. Traver leaves her husband, Harry L. Traver, 53; her father, Louis LeClair, and her sister, Carol, of Vermont; and her brother, Ernest, with the U.S. Army. Laura’s estate was awarded $9,000 by the arbitration board.